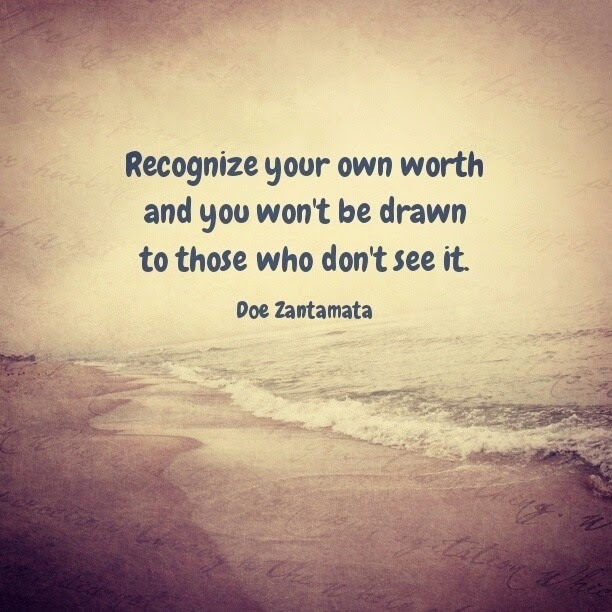 Recognize your own worth and you won't be drawn to those who don't see it. Always be aware of your feelings. 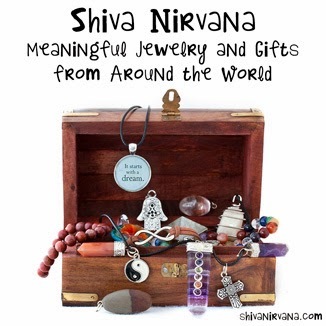 They are the voice of your intuition…your inner truth. A lot of times in relationships, people are very happy and excited to be in something new, and are very complimentary and notice all the good little things. Then after awhile, especially in those who are insecure, they lose that initial "niceness" and instead begin to get comfortable. Eventually, some start to seem to notice only the little things they don't like or that bother them, and have forgotten all about the good little things. This can happen subtly over time, so it's good to keep track of your inner feelings at all times. If you notice not feeling right, don't second guess yourself or talk yourself out of it. Reflect on that feeling and what it means to you. There are some people who feel that once a person is "hooked," they don't have to work anymore. The initial niceness was just a show. If you're convinced that how they were is how they are, you'll be disappointed. The only way they are that way is if someone is new and must be won. Decide what you'd like in a relationship, what you really need, and what you just can't live without. Evaluate yourself on if you're giving those things. Evaluate your relationship on if those things are being given to you. Speaking up is a good thing, but if you have to speak up constantly about things that you honestly feel should be there because they were before, then it may mean that you're only in love with the persona your partner put on in the beginning of the relationship…not who they really are on a daily basis. Of course everyone is on their best behavior in the very beginning, but there is a big, huge grey area. Be honest with yourself on if who they are is totally not who you thought they were. It may be that you fell in love with someone who didn't really exist after a few weeks. 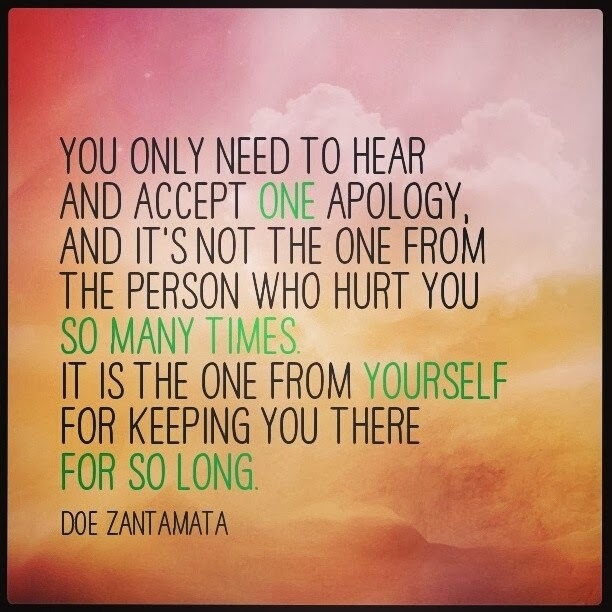 You only need to hear and accept one apology, and it's not the one from the person who hurt you so many times. It is the one from yourself for keeping you there for so long. "I'm doing my best and they don't like me. What's wrong with me?" "I'm doing my best, and they don't like me. What's wrong with them?" 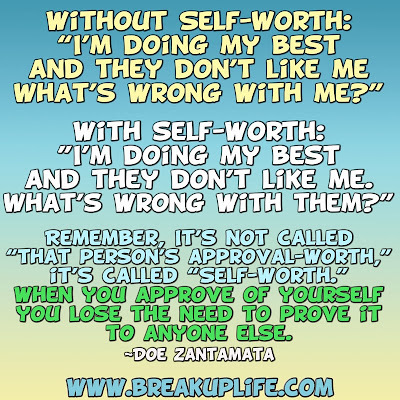 Remember, it's not called, "That person's approval-worth," it's called "self-worth." When you approve of yourself, you lose the need to prove it to anyone else. One more try or enough is enough? 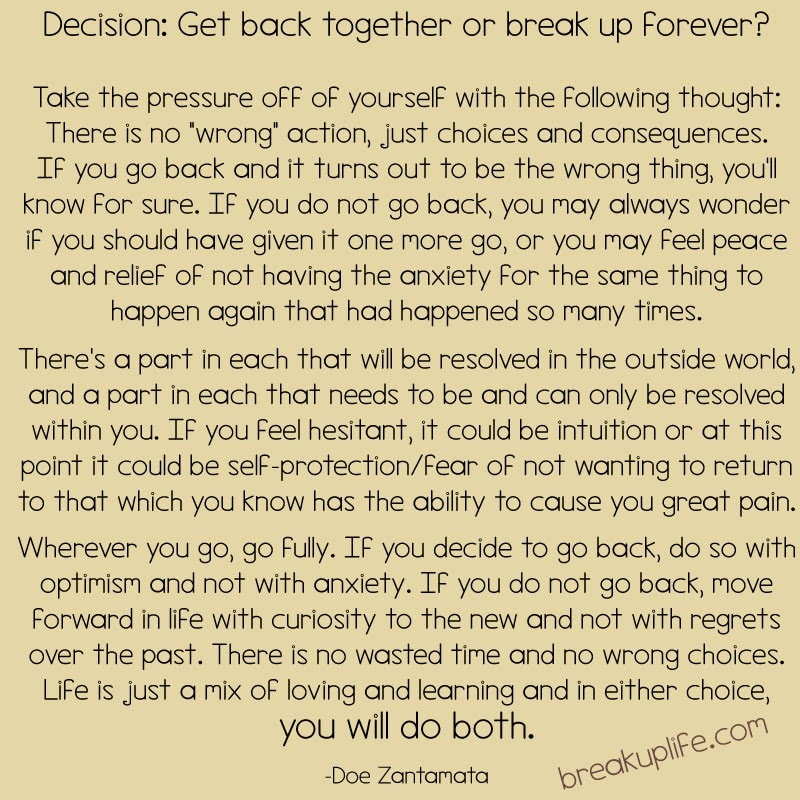 Decision: Get back together or break up forever? Take the pressure off of yourself with the following thought: There is no "wrong" action, just choices and consequences. 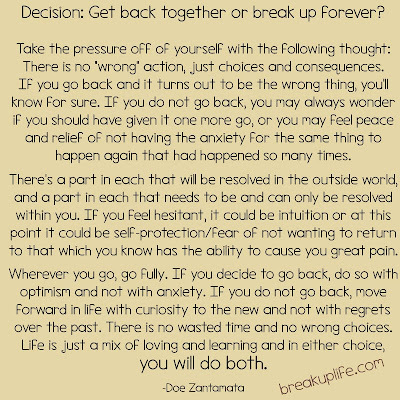 If you go back and it turns out to be the wrong thing, you'll know for sure. If you do not go back, you may always wonder if you should have given it one more go, or you may feel peace and relief of not having the anxiety for the same thing to happen again that had happened so many times. There's a part in each that will be resolved in the outside world, and a part in each that needs to be and can only be resolved within you. If you feel hesitant, it could be intuition or at this point it could be self-protection/fear of not wanting to return to that which you know has the ability to cause you great pain. 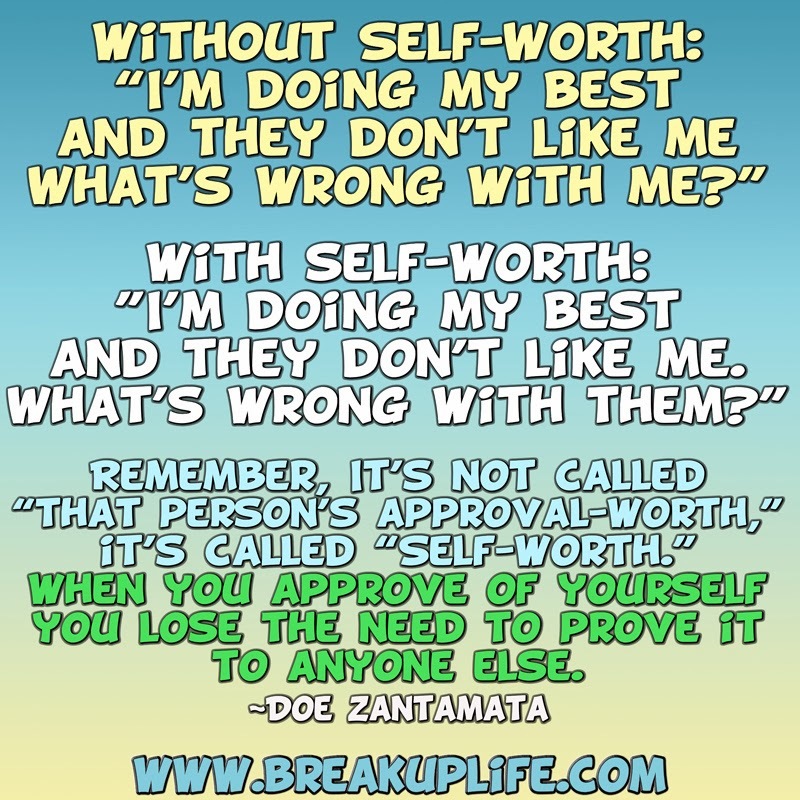 Taking back self-worth and keeping it.